by Adams, Elaine P., Husted, Stewart W., Mason, Ralph E.
Adams, Elaine P., Husted, Stewart W., Mason, Ralph E.
The first edition ofCooperative Occupational Educationwas published at a pivotal point in the history of cooperative and work experience education. Prior to that time (1965), the cooperative plan of instruction had been extensively used in some states, but not in all, and in some fields, notably marketing education and industrial education. Although the cooperative plan was being used at the post-secondary level, it was not in widespread evidence. Soon after the passage of the Vocational Education Act of 1963, many districts began to introduce the cooperative plan, especially in business occupations, home economics occupations, health occupations, and agricultural occupations. Thus, the first edition met a felt need--it was adopted for many pre-service collegiate courses and many in-service workshops and conferences. The second edition was reorganized to serve all vocational areas using the cooperative plan. Like the first edition, it was widely used as a reference handbook by curriculum directors, local administrators and consultants for vocational education, and graduate students. The third edition continued to have the practical directness of a handbook. Emphasis remained on the everyday details of organizing and operating the cooperative plan. Much more theoretical substance was added to work, study and general work experience plans, and much more detail was given to the concepts behind the career development of the individual. The conceptual base behind educational decision-making was re-emphasized, with the topics presented in a logical sequence of educational planning--strategy-structure-system. The modified edition of 1986 incorporated the legislative changes in vocational education stemming from the Carl D. Perkins Vocational Education Act of 1984 and the job Training Partnership Act (JTPA) of 1982. The fourth edition retained the logical sequence of educational planning (strategy-structure-system), and it continued to stress the impact of current vocational legislation. The legal aspects of cooperative education were discussed in considerable detail. The application of the plan at the post-secondary, collegiate, and adult levels and to agricultural occupations, home economics occupations, and health occupations was expanded. The fifth edition contained material dealing with the Carl D. Perkins Vocational and Applied Technology Education Act of 1990, with developments in new legislation, and with the integration of tech-prep and apprenticeship provisions as they apply to cooperative education. The sixth edition discusses the key points of the Carl D. Perkins Vocational and Technical Education Act of 1998. Other major developments are covered, and current terminology is used throughout. The Bibliography has been updated to include the latest references. 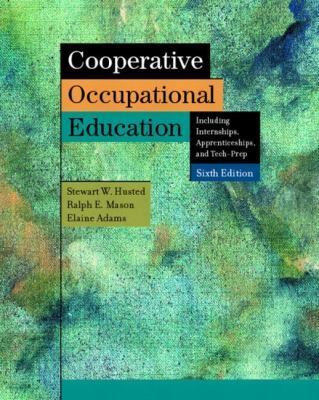 Stewart W. Husted Ralph E. Mason Elaine AdamsAdams, Elaine P. is the author of 'Cooperative Occupational Education Including Internships, Apprenticeships, and Tech-Prep', published 2002 under ISBN 9780131104129 and ISBN 0131104128. Loading marketplace prices 6 copies from $88.17 How does the rental process work?